We all have a unique taste in nail polishes. Some of us love glitters, some shimmer and some textured, but today i have a polish which won everybody's heart in nail world. 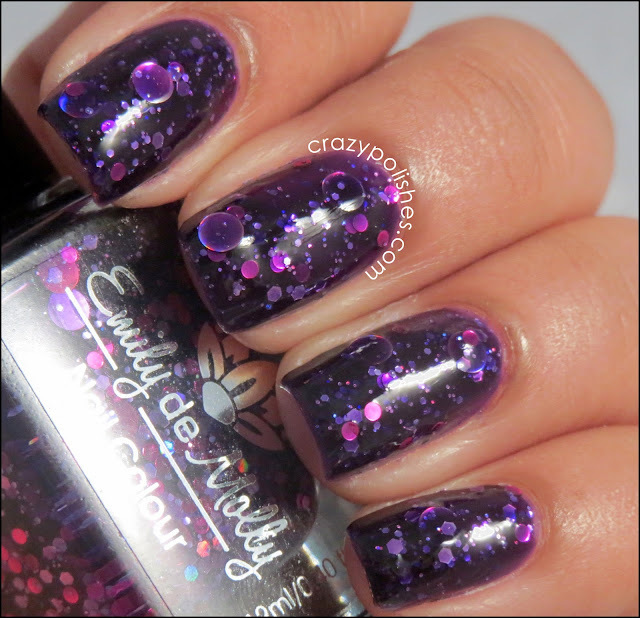 I always drooled on Emily De Molly polishes and when lovely Sally announced that she gonna stock Emily De Molly Polishes on Sally Magpies, i ordered Cosmic Forces and Majestic Flight, which I was lemming from the time when i first saw them. Cosmic Forces is a purple/plum jelly polish with big round lavender holographic glitters along-with pink and purple small round and hex glitters. I applied 2 coats of Cosmic Forces and topped with a coat of seche vite. You can apply 3 coats for more opaque look , i wanted it to look like jell-ish so only applied 2 coats. You can also layered it over another polish. Formula is nice although the big circle glitters sink to bottom so a gentle shake before application is must and little placement of circle glitters needed but its not very hectic and totally worth it. So, I bet that you like it and drooling like i was. Emily De Molly polishes are available directly from Emily De Molly Etsy store or her Big cartel shop if you are in Australia. You can find Emily De Molly polishes at Sally Magpies in UK. P.S. Enter in my giveaway to win any 4 holographic polishes of your choice from born pretty store. Click on the giveaway image in right sidebar. Wow dimple, I loved themmm.so cool. Twitter competition with Jacava London! crazypolishes. Picture Window theme. Powered by Blogger.